We report on microscopic observation of solvation by argon atoms of excited states of an ethylenic-like molecule, TDMAE (tetrakis dimethylaminoethylene). Two experimental methods were used: gas phase dynamics for the observation of the evolution through excited states, matrix isolation spectroscopy for characterization of the initial states. Excited state dynamics was recorded after the molecule had been deposited on the surface of a large argon cluster (n ≈ 100) by pick-up. The deposited cluster was characterized by mass spectrometry and by its shifted photoelectron spectrum. 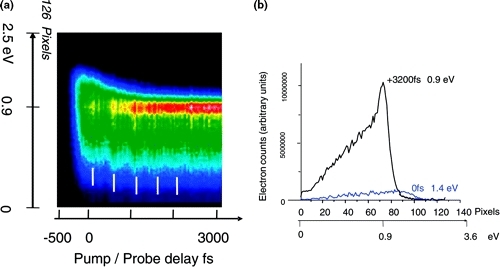 The time evolution of the system was visualized by femtosecond pump/probe velocity map imaging of photoelectrons. The time evolution of deposited TDMAE excited at 266 nm can be modeled via a modified three state model, as in the free molecule. The initially excited state is of valence character, and a Rydberg state mediates the passage to a zwitterionic configuration. The specific solvation of Rydberg states by the surface of the cluster was directly observed and is discussed. It represents the striking outcome of the present work. It is inferred that differently from the gas phase, solvated Rydberg states resulting from state mixing within a Rn/λ complex in the presence of the argon surface are reached. Solvation of these Rydberg states should be effective through interaction of the ion core of the excited molecules with the cluster.